Kenyans vote, fearing repeat of 2007 post-election violence. 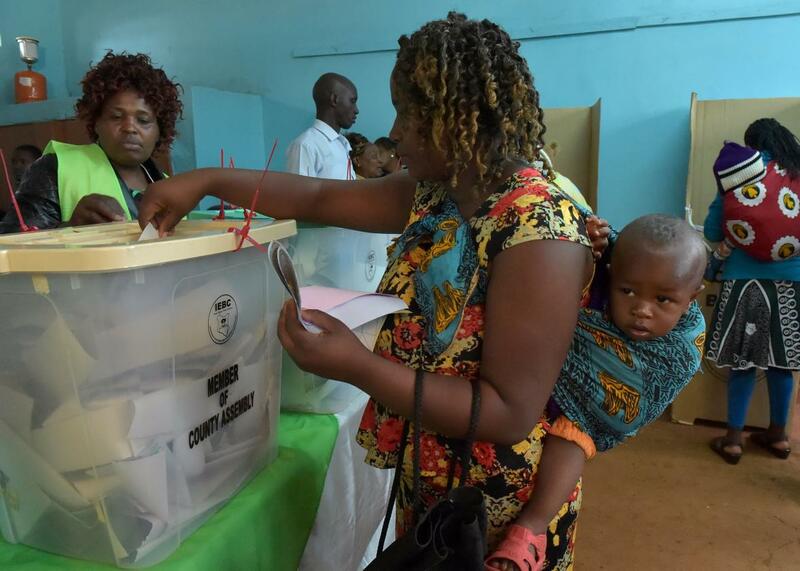 A woman carrying a baby on her back casts her ballot at a polling station in Gatundu South, Kiambu county, during general elections on Tuesday. Hell didn’t break loose Tuesday during voting in Kenya’s close-fought presidential election—but the real moment to worry about is Wednesday, when the results are expected to be announced. That’s when many fear a repeat of 2007, when post-election violence killed 1,400 people and displaced more than half a million, nearly plunging the country in outright civil war. In that election, Mwai Kibaki was declared the winner over Raila Odinga after initially trailing, prompting allegations of fraud. The violence broke down along ethnic lines, with Kibaki’s Kikuyu tribe and Odinga’s Luo fighting each other in riots and brutal street battles. There were widespread reports of sexual violence and torture. Finally, a deal brokered by former U.N. Secretary-General Kofi Annan made Kibaki president and gave Odinga the newly created position of prime minister. That explosive episode would come to influence every subsequent Kenyan election. In 2013, Odinga lost again to Uhuru Kenyatta. There was no violence that time, but the result was controversial because Kenyatta was then under indictment by the International Criminal Court for crimes against humanity over his alleged role in the 2007 violence. The charges, portrayed by Kenyatta as neo-imperialist interference, may have backfired, driving Kikuyu voters to the polls. The ICC dropped the charges against Kenyatta in 2014, with prosecutors accusing the Kenyan government of blocking their investigation. This year’s election is a Kenyatta vs. Odinga rematch. They are the sons, respectively, of Kenya’s first president and first vice president, who were also fierce rivals during the 1960s and ‘70s. Kenyatta is trying to avoid becoming the first Kenyan president to lose re-election. And at 72, Odinga is looking at his last chance. Kenyatta is running on a record of economic growth and infrastructure projects, including a new Chinese-built highway between Nairobi and the port city of Mombasa. Odinga counters that Kenyatta’s administration is mired in corruption and dominated by his fellow Kikuyus. The election is likely to be close, and if neither man can get over 50 percent of the vote, there will be a runoff, further raising the tension. Election procedures and security are thought to have improved since 2007. Election observers including former U.S. Secretary of State John Kerry are on the ground, and former President Barack Obama has urged calm in his father’s native country. There were vague reports of “insecurity” at a few polling places, but mostly the vote seems to have been peaceful and orderly. There’s reason for concern: Last month, Christ Msando, the head of IT for the country’s election commission, who had helped develop a new electronic ballot system, was found tortured and murdered in the outskirts of Nairobi. There have also been recent attacks by the Somali militant group al-Shabaab and increasing attacks by armed nomadic cattle herders on locals in the drought-hit Laikipia region. A recently instituted gender quota for the country’s parliament has also prompted a backlash in the form of widespread violence against women running for office. The election has implications beyond Kenya’s borders. For one thing, as analyst Murithi Mutiga of the International Crisis Group notes, Kenya’s main port at Mombasa is the primary entry point for imported goods into eastern Africa, and the 2007 violence resulted in food shortages for landlocked countries like Rwanda and Uganda. With its combination of a large economy, vast disparities of wealth, and political instability, Kenya is also viewed as something of a bellwether. After years of steady gains, the spread of electoral democracy in Africa seems to have stalled somewhat. The recent presidential election in Zambia, generally considered a poster child for political stability, was marred by violence and controversy. Rwanda’s Paul Kagame, elected to a third term with a dubious 99 percent of the vote last week, seems destined to join the ranks of the continent’s “forever presidents.” The Democratic Republic of Congo’s Joseph Kabila seems to have decided he doesn’t need to hold elections at all. So while the stakes of these tense contests are obviously highest for Kenyans themselves, they won’t be the only ones anxiously watching the events of the next few days.